The legal concepts of residence and domicile are very different and the distinction between them can sometimes be crucial. 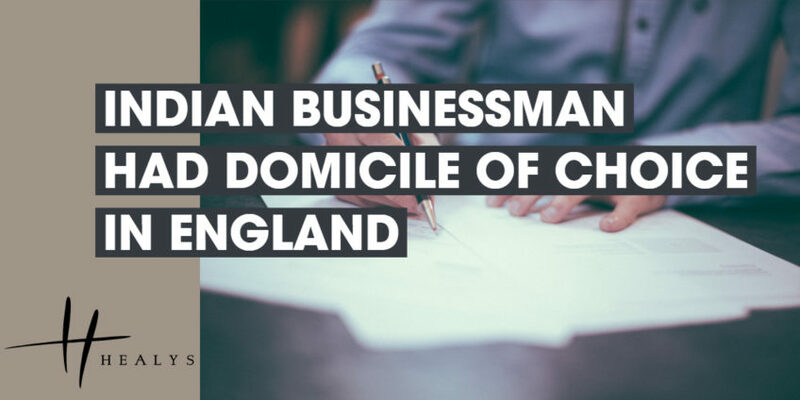 That was certainly so in one case in which the High Court found that a businessman who was born and died in India was nevertheless domiciled in England. An English woman who had borne a child to the businessman lodged a claim under the Inheritance (Provision for Family and Dependants) Act 1975, seeking reasonable provision for their daughter from his substantial estate. Her claim could only succeed if the businessman was domiciled in England when he died. There was no dispute that the businessman’s domicile of origin was India, where he was born. His wife of more than 30 years had lived in the subcontinent throughout and was the sole beneficiary of his will. After being diagnosed with cancer, he had returned to India and his UK visa had expired prior to his death. Following a preliminary hearing, however, a judge found that his domicile of choice was England. He had moved to this country about 12 years before his death and his sons had been educated here. He had engaged in various commercial ventures in England and, although he had not applied for British citizenship, there was evidence that he had intended to do so. In dismissing an appeal against that decision brought by the businessman’s widow, the Court could detect no fault in the judge’s findings on the evidence. The fact that he had chosen to return to India before his death did not mean that he had abandoned England as his domicile of choice. Although he may have been turning a blind eye to the inevitable, there was evidence that he had intended to return to this country.